Type 2 diabetes is a lifelong (chronic) disease in which there is a high level of sugar (glucose) in the blood. Type 2 diabetes is the most common form of diabetes. Insulin is a hormone produced in the pancreas by special cells, called beta cells. The pancreas is below and behind the stomach. Insulin is needed to move blood sugar (glucose) into cells. Inside the cells, glucose is stored and later used for energy. When you have type 2 diabetes, your fat, liver, and muscle cells do not respond correctly to insulin. This is called insulin resistance. As a result, blood sugar does not get into these cells to be stored for energy. When sugar cannot enter cells, a high level of sugar builds up in the blood. This is called hyperglycemia. The body is unable to use the glucose for energy. This leads to the symptoms of type 2 diabetes. 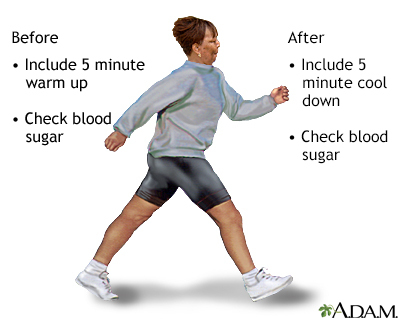 Type 2 diabetes usually develops slowly over time. Most people with the disease are overweight or obese when they are diagnosed. Increased fat makes it harder for your body to use insulin the correct way. Type 2 diabetes can also develop in people who are not overweight or obese. This is more common in older adults. Family history and genes play a role in type 2 diabetes. Low activity level, poor diet, and excess body weight around the waist increase your chance of getting the disease. Your doctor may suspect that you have diabetes if your blood sugar level is higher than 200 milligrams per deciliter (mg/dL) or 11.1 mmol/L. To confirm the diagnosis, one or more of the following tests must be done. Fasting blood glucose level -- Diabetes is diagnosed if it is higher than 126 mg/dL (7.0 mmol/L) two different times. Hemoglobin A1c (A1C) test -- Diabetes is diagnosed if the test result is 6.5% or higher. Oral glucose tolerance test -- Diabetes is diagnosed if the glucose level is higher than 200 mg/dL (11.1 mmol/L) 2 hours after drinking a special sugar drink. 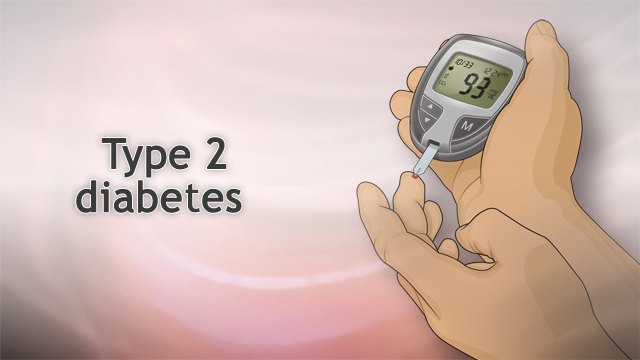 If you have been diagnosed with type 2 diabetes, you need to work closely with your doctor. See your doctor as often as instructed. This may be every 3 months. The following exams and tests will help you and your doctor monitor your diabetes and prevent problems. Check the skin, nerves, and joints of your feet and legs. Have your blood pressure checked at least once a year (blood pressure goal should be 140/80 mm Hg or lower). Have your A1C tested every 6 months if your diabetes is well controlled. Have the test every 3 months if your diabetes is not well controlled. Get tests once a year to make sure your kidneys are working well (microalbuminuria and serum creatinine). Your provider may want to check your vitamin B12 blood levels if you are taking the drug metformin. At first, the goal of treatment is to lower your high blood glucose level. Long-term goals are to prevent complications. 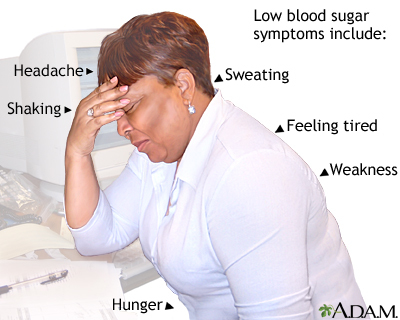 These are health problems that can result from having diabetes. The most important way to treat and manage type 2 diabetes is by being active and eating healthy foods. Everyone with diabetes should receive proper education and support about the best ways to manage their diabetes. Ask your doctor about seeing a diabetes nurse educator and a dietitian. It may take several months to learn these skills. Keep learning about diabetes, its complications, and how to control and live well with the disease. Stay up-to-date on new research and treatments. Make sure you are getting information from trustworthy sources, such as your doctor and diabetes educator. To check your blood sugar level, you use a device called a glucose meter. Usually, you prick your finger with a small needle, called a lancet. This gives you a tiny drop of blood. You place the blood on a test strip and put the strip into the meter. The meter gives you a reading that tells you the level of your blood sugar. You may need to test more often if you are having more frequent low blood sugar symptoms. Keep a record of your blood sugar for yourself and your doctor. Based on your numbers, you may need to make changes to your meals, activity, or medicines to keep your blood sugar level in the right range. The CGM has a sensor that is inserted just under the skin to measure glucose in your tissue fluid every 5 minutes. Work closely with your health care providers to learn how much fat, protein, and carbohydrates you need in your diet. Your meal plans should fit your lifestyle and habits and should include foods that you like. Obese people whose diabetes is not well managed with diet and medicine may consider weight loss (bariatric) surgery. Talk to your doctor before starting any exercise program. People with type 2 diabetes may need to take special steps before, during, and after physical activity or exercise, including adjusting doses of insulin if needed. If diet and exercise do not help keep your blood sugar at normal or near-normal levels, your doctor may prescribe medicine. Since these drugs help lower your blood sugar level in different ways, your doctor may have you take more than one drug. Some of the most common types of medicines are listed below. They are taken by mouth or injection. You may need to take insulin if your blood sugar cannot be controlled with any of the above medicines. Most commonly, insulin is injected under the skin using a syringe, insulin pen, or pump. Another form of insulin is the inhaled type. Insulin cannot be taken by mouth because the acid in the stomach destroys the insulin. Diabetes can also damage blood vessels. Small sores or breaks in the skin may become deeper skin sores (ulcers). The affected limb may need to be amputated if these skin ulcers do not heal or become larger, deeper, or infected. Get a foot exam by your doctor at least twice a year to learn if you have nerve damage. Make sure you wear the right kind of shoes. Ask your doctor what type of shoe is right for you. Some people with type 2 diabetes no longer need medicine if they lose weight and become more active. When they reach their ideal weight, their body's own insulin and a healthy diet can control their blood sugar level. Your feet and skin can develop sores and infections. If the wounds do not heal properly, your foot or leg may need to be amputated. Infections can also cause pain and itching in the skin. These symptoms can quickly get worse and become emergency conditions (such as seizures, hypoglycemic coma or hyperglycemic coma). You can help prevent type 2 diabetes by staying at a healthy body weight. You can get to a healthy weight by eating healthy foods, controlling your portion sizes, and leading an active lifestyle. Some medicines can also delay or prevent type 2 diabetes in people at risk of developing the disease. Moustarah F, Brethauer SA, Schauer PR. Glycemic control and cardiovascular disease risk reduction after bariatric surgery. In: Cameron JL, Cameron AM, eds. Current Surgical Therapy. 11th ed. Philadelphia, PA: Elsevier Saunders; 2014:682-691.